The beginning of 2019 has been a busy time at Los Islotes. We have started the construction of underground electric utilities. We continue to work on roads to the beach, Panama Jack’s beach bar, and work on the main road, Avenida Los Islotes, continues as well. New signs to Los Islotes were posted along the roads leading to the community. Our three horses are loving their new fenced in corral and stables. In February, we started construction on a new bridge along Avenida Los Islotes which will be the start of a new lakeside amenity area. March 2019- We had two baby horses, foals, born at Los Islotes this month. It was an exciting time, and they are doing well. We have started to plant seeds from France for our formal floral gardens and also our apothecary gardens. Road work continues on Calle Pelicano, and Calle Osprey. The work on the underground utilities also continues, as well as work on the bridge along Avenida Los Islotes. Look here for new pictures and updates as the year goes on. Bridge on Avenida Los Islotes. The start of a lake side amenity area. This carnaval weekend in Panama, folks are sunning, swimming, and snorkeling in the ever-present sea… singing, drinking, and dancing in the streets… and generally having a rousing good time. We are, too. Though our idea of fun may seem a little different. This carnaval season, Lief and I have decamped to our favorite escape—the Los Islotes community we’re evolving on the western coast of Panama’s Azuero Peninsula. Out here at the edge of nowhere, you make your own entertainment. Daylight hours, though, we’re otherwise occupied. This week, for example, we’re making raised garden beds so we can plant the seeds we brought back with us from Paris. Not much seed variety available in Panama, but in Paris you can find most any seed you can imagine and you can buy it any time of year. We got the idea for this when passing through the small town of Troyes in northeastern France last year. The apothecary garden here dates to the Middle Ages and is a rare example of the efforts of monks of the time to test and develop plants and herbs with medicinal value. The apothecary garden at Troyes is divided into four sections. One grows plants helpful for digestive disorders… one grows plants useful for circulatory problems… a third area is for plants that help alleviate pain… and the fourth section is for everything else. We’re following the same model with our Los Islotes apothecary garden. We’re also building corrals and stables for our three horses. A couple of months ago, Los Islotes Project Manager Carlos told us about three horses for sale locally. Now, after some weeks of training, all three are ridable, and, turns out, one is also pregnant! Our soon-to-be four horses need housing. Carlos has designed stables in keeping with the Spanish-colonial style of the community overall. The stables are going up across the road from the town square, which will be anchored by a church with a bell tower… again, Spanish-colonial style. Our house finally finished (after four years of effort… nothing comes easy in paradise), we’re able to settle in and hunker down. Focus is helping our Los Islotes vision to evolve in real time. I’d better get going. Carlos and Lief are waiting. We’re heading down to the beach to see where we might position the open-air amphitheater I’d like to build alongside our Panama Jack’s Beach Bar. “Señora Kathleen, come see,” Dalys called to me from outside. I got up from my desk and followed the sound of her voice. She was standing off to the side of our little Los Islotes office with a bright grin. “What is it, Dalys?” I asked. Dalys and I have been planting, cultivating, and potting, trying to pretty up the area around our new Los Islotes base of operations. After a few months of effort and care, we were rewarded last week with our first flowers. The bougainvillea we planted at the entrance gate finally showed us the answer to the question we’ve been considering—what color would the blossoms be? Now we know. Fuchsia. Since the start of this dry season (or summer, as the Panamanians call our current sunny situation), we have also been pushing hard on infrastructure installation out here at our Los Islotes community on Panama’s Azuero Sunset Coast. And we have passed long-worked-for milestones. After Herculean effort and years of back and forth with Unión Fenosa, the local service provider, we have electricity to the property. We also have internet… the best on this coast thanks to the solar-powered tower we’ve installed. Lief and I have put our new internet to the test these past few weeks we’ve been working from the Los Islotes office. From live interviews over Skype with U.S. media and conference calls with parties spread across four or five countries at a time, to file-sharing with our LIOS office in Panama City and streaming movies on Netflix… we’ve done it all… without missing a deadline or an opportunity. In addition to bringing electricity and the internet to the property, we’ve dug a new well… buried massive tubes underground for water and wastewater services… and plumbed our new beach bar. Panama Jack’s, our little open-air oceanfront hangout, now boasts running water, two operational bathrooms, and even outdoor showers for rinsing off after your ocean swim. These may not sound like groundbreaking, newsworthy accomplishments, but, out here on this wholly untouched coast, in fact, they are. The flowering bougainvillea at our entrance gate last week was the cherry on top. Finally the pieces are coming together. To be honest, Lief and I had no idea what we were getting ourselves into when we undertook the development of the beachfront hectares we named Los Islotes. Now, years later, it’s Dalys, the young local Panamanian girl we’ve hired to manage the Los Islotes office and work crew, who is helping me to understand what’s really going on. What are we doing out on this stretch of Panama’s Pacific coast? Over the years, I’ve wondered often about the real answer to that question. “It is exciting for me to be part of Los Islotes,” Dalys told me recently. “When I was a little girl, my friends and I would ride our horses through this property to get to the beach to go swimming. We would play in the water and then, after, chase the monkeys in the nearby trees. “When it was time for the turtles to lay their eggs, we would come at night to watch. Dalys is 26 years old. When she was 11, her mother gave her a children’s book in English. Dalys taught herself to read English… and then to speak English. Those are uncommon skills in this part of Panama, and they make Dalys very valuable to us. Plus, of course, she knows this coast from a lifetime of firsthand experience. “I’m starting to see your vision for this place,” Dalys said the other day. “You are building something special… something that will continue for a very long time. “For years, I have had the idea that I would like to have a real career… more of a career than I imagined I could have here in Veraguas. “At the same time, though, I did not want to leave this place. All four of my grandparents are still alive, and they all live within a short walk of the house where I live with my mother. I see my grandparents every week. Family is important to me. “So I was torn about the plan for my future. Dalys promises to introduce me to some of her friends who fit that description. Meantime, little by little, day by day, she continues to show me what’s really going on out here on this Azuero Sunset Coast. This is the time of year to remember, recalibrate, regroup, and reset your sights. Where have you been… and, more important, where are you going from here? For Lief and me, as we stand on the threshold of 2019, the answer to that question has a great deal to do with a piece of beachfront property that we bought, nearly a decade ago now, on Panama’s Azuero Sunset Coast. Finally, our vision for this stretch of Pacific paradise is becoming clearer. Lief and I like to wander. At this stage, though, while we still prize change and contrast, we’re increasingly preoccupied with an urge to establish roots… to build a home for ourselves and our children in a place where our neighbors share our ideas about what’s important and interesting… and where we’re all able to embrace the best of Mother Nature while also enjoying the comfort and convenience of top-end 21st-century living. A place where we and our families can live independently, even self-sufficiently… while enjoying each other’s company and also contributing and helping to improve the greater local community all around us. This is our plan for Los Islotes, as our Azuero Sunset Coast undertaking is called. On this stretch of the crashing Pacific we are working to create a society for people who appreciate the beautiful natural setting, the privacy, safety, and elbow room this part of Panama offers, and the prospect of settling down long term, full- or maybe only part-time, among like-minded folks with similar perspectives and priorities. Our efforts are building momentum. We’re one of the biggest employers in the region already, and, in 2019, our workforce will continue to grow. Our teams are laying pipes, cutting roads, and building houses. They’re planting trees, creating gardens, designing stables, and fencing off corrals for our first horses (who we’ve named Señora Cortez, Drake, and Guadeloupe). With high season for this part of the world just around the corner, they’re also sprucing up our Panama Jack’s beach bar and generally pruning, clearing, cleaning, and applying a fresh coat of paint. Los Islotes is reshaping this part of Panama and becoming a big force in the local community. And Lief and I are getting to know our neighbors. One of them told us something recently that got my attention. She explained that the schools in the region have trouble finding good teachers. “As you know, there are three little schools in the area around Los Islotes,” she told me. “All of the kids who attend walk to reach the schools each day. “Some of these kids,” she continued, “walk up to two or three hours each way. The trouble is, many days they arrive at school to find no teacher. If a kid so wants to learn that he’ll walk three hours to get to the nearest schoolhouse, someone ought to be there when he shows up to teach him something. We’ve been trying to support these little schools for the past few years. We’ve donated books, computers, and other materials and supplies. It’s been a well-intentioned but ad-hoc, irregular, and, I realize, far from comprehensive effort. One of my primary 2019 goals is to step things up on this front. With the help of our Los Islotes Project Manager Carlos Correa, we’re going to open this year a Student Center for kids in the area interested in learning. It’s a first step toward starting a school. A landowner in the area has donated a piece of land in a central location. Live and Invest Overseas and Los Islotes will provide the money to build and outfit a four-room schoolhouse. We’ll hire an administrator and recruit additional volunteers to help her with teaching and tutoring. As we’ve done with all our overseas operations over the past decades, we’ll begin small and let things evolve organically. To start, the Student Center will offer English-language classes, computer literacy classes, after-school tutoring, and a lending library. Of all the plans I’ve made for this New Year, this is the one I’m most excited about. If I could, I’d move out to Los Islotes and volunteer my own services. Pitching in to build this little schoolhouse and then spending time there each day with the kids from the area who make their way to it seems a worthwhile pursuit. I share this plan with you in case you intend to be in this part of Panama and might be interested in becoming involved. Starting sometime in 2019, we’ll be in the market for someone to help manage our Student Center, as well as a couple of good teachers. Primary qualification is that you promise to show up. You can reach me here if you’d like to know more. We have internet out here at Los Islotes… the best on this coast thanks to the solar-powered tower we’ve installed. Lief and I have put our new internet to the test these past few weeks we’ve been working from the Los Islotes office. From live interviews over Skype with U.S. media and conference calls with parties spread across four or five countries at a time, to file-sharing with our LIOS office in Panama City and streaming movies on Netflix… we’ve done it all… without missing a deadline or an opportunity. We got a later than expected start last Sunday and so didn’t arrive until after dark. When we came around the bend in the road and saw the lights at the entrance gate, Lief and I both relaxed. When I looked over, he was smiling. The Los Islotes Effect had begun to do its thing. One of the crew ran out to swing open the gate as we approached. Then he came to the car window to shake our hands and wish us welcome. A few minutes later we were parking our SUV in our garage, unloading the groceries we’d brought with us, and allowing ourselves to settle into the experience that is Los Islotes. We opened the French doors to the balcony off the living room, and the fresh night air filled the room. We heard the crash of the Pacific Ocean a little off in the distance… and, nearer, the cries of our resident troop of howler monkeys. They like the black walnut trees that grow alongside the swimming pool. We have four televisions in the house here but have yet to turn one of them on. We haven’t discussed it or made a conscious choice… but this has become our media-free zone. No cable news, no network television… and no Netflix either. We have the high-speed internet to support it… but just aren’t tempted. Instead, after dinner each evening, we sit drinking wine on the balcony, enjoying the night view of the ocean in front and the rain-forest-covered mountains all around. Sometimes friends join us. This week the nighttime scene has been lit by a brilliant moon. We’re asleep by 10 p.m.
And up each morning with the sun. We’ve been lucky this visit… because there has been some sun. This is the height of the rainy season, but we’ve enjoyed clear skies at least part of each day. And all the rain this time of year has an upside. The view from every window and in every direction is decadently green. First order of business is our regular reports to you, dear reader. Lief and I sit at opposite ends of our dining room table tapping away at our laptops. Daily deadlines met and emails answered, we turn the running of the Live and Invest Overseas operation over to our cracker-jack team back in the office in Panama City And turn our attention to Los Islotes. Lief and I like to move around, from country to country and from city to city, and we prefer to come and go with a purpose. So rather than going kayaking, paddle boarding, surfing, diving, swimming, or fishing—all activities enjoyed by most folks who make their way out to this Azuero Sunset Coast—we spend our afternoons in the company of our cracker-jack Los Islotes team reviewing progress since our last visit and making new project to-do lists. Priority focus remains the installation of infrastructure. Next time you see me, if you’re interested, I’ll tell you stories about our experiences with Unión Fenosa, the company that provides electricity in Panama. For reasons we can’t figure out—hard as we continue to try—Unión Fenosa hasn’t seemed overly concerned about providing electricity to our little corner of this country. It’s been one delay, excuse, additional review, further required approval, and request for more information after another. Out here at Los Islotes, we started from nothing. Well, not from nothing. Here at Los Islotes we identified a virgin paradise on the Pacific. The sea, the coast, the forest, the mountains, the beach, the views… it’s all the best that Mother Nature serves up anywhere. When we made the decision to focus our attention here, however, this region was one more thing, as well—it was beyond the reach of the 21st century. This is less true all the time… in no small part because of our efforts over the past several years. That high-speed internet I mentioned? We had to find a system that would work out here at the edge of nowhere and a provider who’d install and support it… and then we had to invest personally in the hardware. We’ve cut roads, dug wells, and imported both the labor and the materials required to build what qualify as fully equipped, finely finished, and 21st-century comfortable houses and office space. We’ve persevered through the blah, blah, blah of it all, including and especially with Unión Fenosa. We do, for the record, finally have electricity (thus my ability to write to you today). We just don’t yet have the permits for the underground electricity we intend. Our vision for Los Islotes does not include concrete poles and power lines… though right now a few of them dot the landscape. As soon as Unión Fenosa finally signs off on our plan for taking our power cables underground, though, those poles are history. What is our Los Islotes vision? Here on these verdant virgin hillsides with killer ocean views we’re building a community of like-minded souls who appreciate the natural beauty, the utter tranquility, and the ever-harder-to-come-by-in-our-era privacy of this special place… the Spanish-colonial architectural style and approach to town planning (our town, for example, which we’ve begun planning this week, like all Spanish-colonial towns, will center around a church square)… and the opportunity this still largely untouched coast provides to disconnect completely from the rest of the world. Here at Los Islotes we are well insulated from the worries and troubles of our age. Here at Los Islotes, the instant we pass through the front gate, we are in a cocoon of our own choosing. Here at Los Islotes we make our own reality. It isn’t distracted by daily West Wing scandal or clouded by endless debate over what is and what is not fake news. Who did what to whom when? Greater minds than ours will have to dig in and dig down to answer that question. Our minds this week are working to find answers to questions relevant to the future of the community we’re evolving at Los Islotes. No kidding. Carlos, our Los Islotes project manager, told us last night over dinner that the local lady who has sold us our first three horses also has water buffalo for sale. Luxury-standard Spanish-colonial houses and amenities… and a couple of water buffalo off to the side? In 2007 my husband Tom and I planned a vacation in Cancún. Then, in October, weeks before our trip, the hotel was damaged by a hurricane. We decided to change our plans. Looking at the map, we picked Panama as our replacement destination… primarily because, we realized, it doesn’t get hurricanes. We arrived in Panama for the first time for what amounted to practical reasons. Once here, though, it was love at first sight. We were won over immediately by the country and by the people. We’ve been returning as often as we could ever since. Finally, we agreed that we wanted to do more than come and go as tourists. We wanted to make Panama our home… at least part-time. We’ve been reading Kathleen Peddicord for years… since she was living in Ireland. More recently, we’ve been following her husband’s writings, too. When Kathleen and Lief began writing about their efforts at Los Islotes, on Panama’s western Azuero coast, it got our attention. 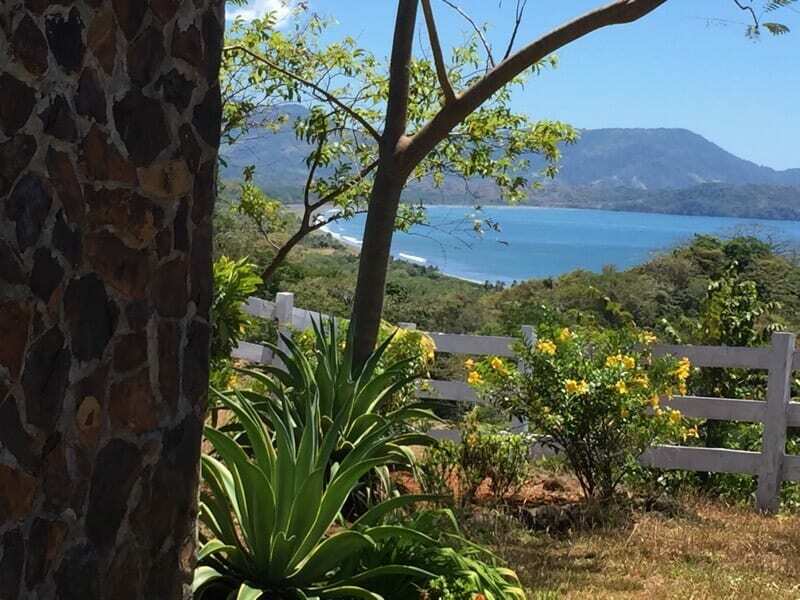 From what we read, Los Islotes had everything we wanted in a part-time retirement home—a private beach, a warm climate, lush mountainous terrain (that remind us of the Hobbit movies), and a gated community. We shopped around… considered other coastal options in Panama… but nothing fit us the way Los Islotes fit us. Affordability was a key factor. Now, three years later, we are moving into our just-finished home in Los Islotes’ Mango Village neighborhood. Our plan is to spend as much time at Los Islotes as possible. We intend to be here every winter… and to spend summer months on Lake Superior in Superior, Wisconsin, where we’re from. When we decided to build a house at Los Islotes, we weren’t sure, frankly, what we’d do with it. We’ve owned and managed rental properties in the United States and thought we could do that here, too. Now that the house is finished, though, and we’ve gotten to know Los Islotes better, we’re thinking we don’t want to rent our new little casa. We want to live in it ourselves! Our plan now is to hire a property manager back in the States so we can spend as much time as possible in our new home in Panama. We’re here now indefinitely. We’re going to live in our new home while getting to know the area better and trying to gauge the real demand for rentals. Eventually, we think we might rent out this house and build another one on another lot in a different section of Los Islotes. Back in the States, Tom worked for Motorola as a cellular communications engineer. He was in their overseas division. This took him to 23 countries, mostly in Central and South America. That travel helped to make our transition to part-time living in Panama easier. I spent my career as a board-certified advanced practice nurse and retired from St. Cloud State University as a professor of psychiatric nursing. I bring that experience with me now to our new home. When we were younger, we enjoyed ice fishing, cross-country skiing, ice-skating, and building snowmen. Now, we look forward to building sand castles on our beach, helping baby turtles find their way back into the ocean, and being warm all the time. We’re embarking on a whole new chapter. And having the time of our lives. Yesterday, Kathleen and I spent the day at the beach. This was a bigger deal than that simple statement might suggest… because it was a day at our beach. More than that, it was our first day at our new Los Islotes Rancho Playa. We’ve spent many days at our Los Islotes beaches, of course, but this was our first visit since our new beachfront amenity was finished. The first time we were able not only to be at our beach… but also to be comfortable at our beach. Basic things… that have eluded us out here at Los Islotes for a long time. Creating something new anywhere in the world can be a challenge… but trying to build a community on a greenfield site in a developing country far from the city qualifies as a Herculean task. Building to real-world standards in the wilderness of Central America requires a level of persistence and commitment that I’m not sure you can appreciate unless you’ve tried it yourself. I can tell you, I’ll never try it again. I can also say, however, now that we’re at long last in a positon to begin enjoying the fruits of our long, hard labors out here at Los Islotes, the feeling of satisfaction when the pieces begin to come together is enormous. We’re finally in a position, for example, to plan events for our Playa Rancho, as we’ve been calling it. In fact, our new beachfront bar will be inaugurated this week… and renamed. When the sign is hung later today, our little bar on the sand will be officially renamed Panama Jack’s. So, we’ve learned, it goes in paradise. Also in the works is a pop-up party. We’ll invite the local expat community to Panama Jack’s for a barbeque at the beach. Expat communities in remote areas need to stick together. Our Los Islotes community and the estimated 300-plus other gringos living out here on this Azuero Sunset Coast are what could be considered the mountain men. We’re like the hearty, independent, adventure-seeking, risk-taking souls who tamed the American West. Of course, it’s not as wild and untamed along this coast as the uncharted western United States of the early 1800s. We have paved roads and shops in the nearby town. We even have a bank and an ATM. However, for the typical person coming from a First World situation, things out here on the Azuero coast are a little more raw than you’re probably accustomed to. You have to make a comprehensive list before you head to the “big city” for weekly shopping trips. If you forget something, you do without it until your next trip. The mountain men charted the path and laid the basic groundwork. They were followed by the pioneers. The pioneers then set to work creating the infrastructure required for the anticipated larger population to come. Along this western Azuero peninsula, this is the stage we are entering now. We mountain men are being joined by the pioneers… and, believe me, we welcome their arrival on the scene. Next will be the settlers. That’s what we’re preparing for now at Los Islotes. The first several houses have been built. The installation of infrastructure continues. And, as I said, our first official community amenity is finally finished and operating. As I write, I’m sitting in our new Sales Office… meeting with our Los Islotes team to plan our next community amenities—specifically, our Los Islotes Clubhouse and our Equestrian Centre. As Los Islotes develops to a next stage, the area around us is developing, as well. More grocery and hardware shops are opening… and, just around the corner (that is, a couple of kilometers away), a small commercial center is under construction. The ultimate plan for this very much appreciated undertaking includes a gas station. At some point not too far in the future, we’ll be able to drive down the road for basic supplies… and even to fill our gas tanks. What a thing. Step by step… little by little… we’re pushing through the pioneer stage, preparing for the settlers to follow. These will be the full-time residents, both here at Los Islotes and elsewhere along our coast. Surviving from the mountain man stage through to the settler stage… man, that’s no easy thing. Many people came out to the Azuero Sunset Coast before they were ready. Or, maybe better said… they came before the coast was ready for them. Costa Rica, Mexico, Roatán, Belize, and different parts of Panama have all moved through the same development cycle over the last 20 to 40 years. In Panama, one of the primary growth areas attracting both tourists and retirees and other expats since the return of the Canal from the Americans to the Panamanians in 1999 has been Boquete. The tipping point in the development of what has evolved to become one of the biggest expat communities in the world turned out to be a single developer who took on the challenge of… well, of doing what we’re now trying to do out here on this country’s western Azuero coast. In addition to houses, this developer took it upon himself to build restaurants, bars, and other amenities, including even a small open-air amphitheater, to support the expected influx of settlers to follow his mountain man follies. Kathleen and I take heart from his ultimate success. Los Islotes officially has two residents. We made the big move on March 8th and are all settled into our little piece of paradise. Lief and Kathleen have also moved into the Founders’ Lodge and have spent lots of time there during the last month. We hope that many of you will be joining us soon so along that vein I thought I would use this month’s newsletter to give you the details on how to proceed when you are ready to make the big move. 1) Title Transfer: We have successfully transferred title to several lots in Phase 1. It has been a difficult and painful process and we are now on our third attorney in an effort to streamline the process. The difficulties began in January of 2017 when the DGI (Panama’s tax authority) updated its computer system. We think the kinks are finally worked out, but time will tell. Mango Village properties are being registered now and we should be able to transfer title on those soon. 2) Survey & Cleaning: The first step in planning your home will be to get a topographical survey to get the lay of the land. We have a topographer on staff that can do this for you for $750.00. Dalys can facilitate this when you are ready. Dalys can also schedule to have your lot cleaned for $300. This is a good idea if you are planning a visit and want to walk your property. 3) House Design: Be sure to review the Architectural Guidelines with your architect. They can be downloaded here. All the homes in Los Islotes must be Spanish Colonial in design with red clay tile roofs. Key points for the exterior are window styles and arches. 4) Architectural Committee: Once you have house plans they need to be approved by the architectural committee (download the submission forms here). They will be reviewed for exterior design as well as placement on the lot. 5) Permits: To get the necessary building permits the architectural plans need to be either created or approved by a licensed Panamanian architect. You will need permits from the Mariato Municipality and the Veraguas Fire Department. 6) Builders: We currently have two builders that have been to the project, met with Lief, have references and speak English. The search continues as there are a number of builders in and around Santiago. Both of these builders have architects on staff. “I got up from my desk and followed the sound of her voice. She was standing off to the side of our little Los Islotes office with a bright grin. Last month we welcomed Carlos Correa, a licensed master electrician and experienced contractor from Colombia. Carlos has taken charge of installing all Los Islotes infrastructure. Carlos prepared the infrastructure schedule the Monday he arrived, and by Friday many storm pipes were already in the ground. Once the storm pipes are in, Carlos will lead the crew to carry on installing water, waste water, and underground electricity. Los Islotes’ first official residents, Peg Fairbairn and April Hess, moved in to their beautiful ocean-view home on March 8. What do Peg and April think of their new life now that they’re at home full time at Los Islotes? “We are loving it!” they respond in unison. Lief and Kathleen are putting the finishing touches on their Founder’s Lodge and were able, during their recent extended stay, to enjoy their first dip in the pool. When you walk into their great room your jaw drops at the sight of beautiful wooden beams under cathedral ceilings and floors covered with brightly colored Spanish-colonial tiles. The place has become a showcase of the style and beauty that is Los Islotes. The third home under construction (and very nearly finished) is on lot #14 in Mango Village. This adorable casa will be move-in ready sometime in May. All of the lighting fixtures, fans, and kitchen granite were installed this week. Completing the bathrooms with tiles and fixtures is next week’s focus. Want To Know More About Los Islotes? Our gold-standard community is definitely the next big thing in Panama, with world-class amenities including swimming pools, an equestrian center, a town center, a fitness center, a private beach bar, hiking trails, and much more. All Los Islotes clients are now welcomed in comfort as they learn about all Los Islotes has to offer. Get in touch here to make an appointment to come on down and see for yourself all the great things going on at Los Islotes. Panama Jack’s Beach Bar is complete and was inaugurated the first weekend of April. Lief and Kathleen hosted the Live and Invest Overseas managerial team to celebrate 10 years of publishing excellence. Cocktails, surfing, horseback riding, paddle boarding, relaxing in the sun, and ocean waves were enjoyed by all. Panama Jack’s Beach Bar is quickly becoming everyone’s favorite spot at Los Islotes.